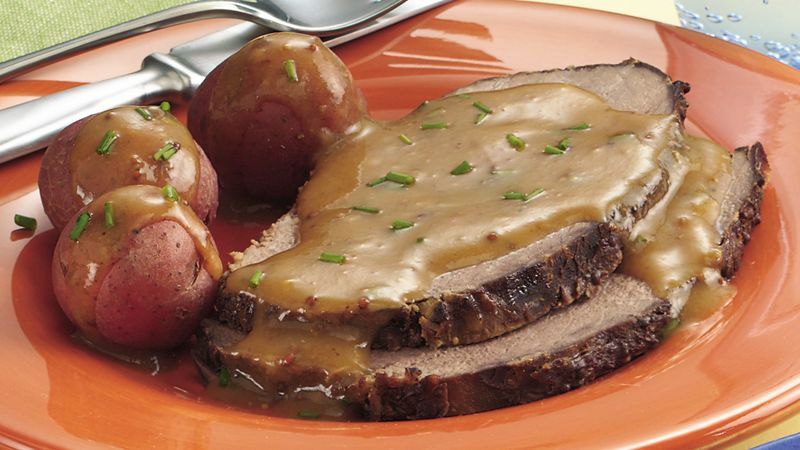 In 3 1/2- to 4-quart slow cooker, place beef roast. In small bowl, mix mustard, horseradish sauce and gravy mix. Spread mixture over roast. Pour beer around edge of roast, not on top of roast. Cover; cook on Low setting 9 to 10 hours. Remove roast from slow cooker; place on serving platter and cover to keep warm. In 2-quart saucepan, blend water and flour until smooth. Pour cooking juices from slow cooker into saucepan. Heat to boiling over medium-high heat, stirring constantly. Stir in chives. Cut roast into slices; serve with gravy. Coarse ground German mustard adds good flavor and texture to this dish, but other mustards can be used, such as spicy brown mustard or country-style Dijon mustard.